Congressional township 136, range 43, was organized as Pelican town ship by the county commissioners on September 5, 1870. The petition, which is dated July 3, 1870, bore the names of twenty-three legal voters and also the humble request to "please call this township Pelican." The names of the petitioners follow: Ole Onsum, Ole Christansen, Mons Olsen, Emerson Harris, ______ Bullman, Thomas H. Birge, Harrison Harris, Wilson Harris, W. F. Cowles, Gordon A. Cowles, Charles Gum, E. Gum, Chrales Burau, Ole Engebritson Sanbe, Ole Seilistad, John Holen, Erland Ellefsen, Erik Rishof, Gilbert Larson, Christian Sorenson, Theodore Hansen and Hans Hansen. It is interesting to note that over half of the signers were Norwegians. The first election was held at the store of S. H. Birge, September 14, 1870. Con gressional township 136, range 42 (now known as Lida township), was attached to Pelican by the county commissioners on January 6, 1875, and remained a part of that township until March 19, 1879, when it was organ ized as a separate township. Pelican township lies in the basin of the Pelican river and the land slopes in such a way that it is easily drained. Prairie lake is the largest and covers nearly a section and a half in sections 10, 11, 14 and 15. The surface of the township is rolling in many parts, but not so rugged but that it can be culti vated. This township was one of the first in the county to be settled. The building of the railroad to it in the early eighties did a great deal toward helping its rapid development. As has been said, the majority of the early settlers were Norwegians, and to this day the people of that nationality predominate. Pelican Rapids. Pelican Rapids was platted by Robert Miller in 1872 for the following proprietors: George B. Wright, A. J. Baldwin, W. J. Tuttle and Harrison Harris. This village is located in sections 22 and 27, township 136, range 43, and is the largest village in Otter Tail county at the present time. The village plat was recorded October 19, 1872. Since that date there have been a large number of additions made to the original plat. About 1870 the advancing tide of immigration which brought Ernest Buse and a few others to Fergus, Rudolph Niggler to Elizabeth, and left Louis Candaux, Alex Erhard, Peter Davis and others in their well-known location to the northward, also brought the first settlers to Pelican Rapids. Among these was W. G. Tuttle, whom fickle fortune tempted with visions of success and wealth only to blight and blast them with the dream that failed to materialize. His claim at the rapids was chosen with good judgment and his two eighties, a mile long, embraced the best water power on the river, together with a good townsite location. He went to work with little capital to improve the power and build his sawmill. Just at this time the famous fraud, "Lord Gordon," having fooled Horace Greeley and swindled Jay Gould in New York, found his way to Minne sota, where he spent the winter of 1870 and 1871 in sporting with Jay Cook and the Northern Pacific Company, then in the course of its construction from Duluth westward. The scheme of the bogus lord was a grand one and commended him to both philanthropists and business men. He proposed to purchase of the Northern Pacific Company twenty-five thousand acres with the rapids for a center, where he would build a city by the name of Loomis. On these and intervening vacant government lands and in the city of Loomis he proposed to colonize some thousands of his poor but industrious, frugal and skilled Scotch tenants. He had visions of building a city and giving them their homes to be repaid when they were able to do so. He pointed out an imagin ary hotel on one corner, a fine bank building on another, with an elegant church on a convenient elevation. He offered to take Tuttle into the pool as a partner and in the following spring (1872) work was to begin in earn est. He would have the then projected St. Vincent railway run from Fergus Falls up the valley past the rapids, and told Tuttle to go on getting out logs for a future lumber supply, telling him that he might cut down logs on any of the railroad land for which he had already contracted. was then compelled to sell it to parties at Fergus Falls in order to raise money to convey herself, husband and children back among New York state friends. Shortly afterwards Tuttle became insane and died in an insane asylum in his native state in the spring of 1882. Gordon, who had a special Northern Pacific train at his command for weeks, was subsequently kidnaped by Fletcher and Hoy in Manitoba, where, escaping, he fled to the wilderness and, being finally put under arrest for high crimes in England, ended his life by a pistol ball through his head. Thus ended the lives of the pioneer of Pelican and an artful scoundrel who haunted the town in its infancy. In the spring of 1882 the leading citizens of the village decided to draw up a petition asking for incorporation, and such petition was finally signed and sworn to before a notary public on April 1. This petition carried the following names: M. B. Gibson, Henry Dussling, Frank E. Blodgett, E. Leonard, H. O. Time, W. H. Hazle, E. Keller, Frank Davis, John F. Cox, J. E. Lacy, J. A. Goodrick, D D. Woodruff, W. H. Pattee, John Simpson, G. S. Hanson, C. H. Burrows, Melim Leonard, Z. I. Burton, H. H. Haugen, H. P. Johnson, N. Tyrrell, N. Compre, E. Collins, Ernest H. Hubbard, Charles Rupell, C. A. Davis, A. A. Woodworth, Anthony Healey, Peter I. Holin, Asa Meyers, Andrew Oleson, Henry Manley, Charles T. Robards, H. N. Bruce, J. W. Stage, J. O. Sands, H. Achmar, B. B. Hovey, K. T. Quale, E. S. Pinkham, L. B. Ramsdell, H. D. Wilcox, L. W. Gray, Hans Mickelson, O. M. Carr, J. P. Wallace, G. W. Batcheller, A. G. Kinney, A. N. Eshelman, W. E. Ingalls, W. G. Cox, R. N. Blodgett, F. Murray, G. B. Puckett, R. R. Kinney, R. A. Pierce, C. A. Life, E B. Gray, F. P. Percival, P. A. Williams, H. W. Bragg, R. E. Lacy, W. P. Reynolds, H. R. Day, M. Fred Fleiseher, L. C. Druy, L. F. Fleiseher, H. L. Ricker, William Hubbard, I. P. Lackey, E. H. Noel, M. F. Jacobs, George Chapman, Joseph Chapman, H. H. Wickum, A. E. Boen, F. E. Holmes, August Anderson, John M. Slet ten, Albert Teilset, Imbert Skreden, Charles Port and Theo. Frazee. The petition stated that the proposed incorporation contained a popula tion of seven hundred. The judge of the district court, S. W. Collins, granted the request of the petitioners on May 16, 1882, and appointed Myron B. Gib son, Henry Dressler and J. P. Wallace to take charge of the election for the selection of the first village officials. The unusual incidents which surrounded the founding of Pelican Rapids have been mentioned, but they had little or no bearing on the future history of the village. For more than forty years Pelican Rapids has been the center of a community life which is not unlike that of all other villages in the state. It had its first merchant, its first postmaster, its first child to be born, and its "first" of everything which goes to the making of a village. Some of these "firsts" have been gleaned from the first settlers of the village and are here presented that future generations may know who was who and what was what. The first settler in the village was Harrison Harris. Harris built the first house, a rude log structure, which stood in the mill pond, about one hundred feet back of the Nelson & Diffendorf store. Harris may be said to be the first tavern keeper and, according to some of the old settlers still living, his caravansary contained one room, which, when trade was brisk, was par titioned off with skins or sheets. Otto Andreas Edward Blyberg was the first merchant, the first postmaster, the first man to build a frame house, the father of the first child born in the village (the child, Lottie Marie, being the wife of C. N. Haugen), and is still alive to tell the story. The first physician was W. H. Pattee, and he was the only one for many years. The first preacher was T. Rosholdt, a Lutheran, who preached the first sermon in the village and officiated in the first church. The first follower of Tubal Cain was Wesley F. Cowles, who served a community within a circuit of twenty miles. His wife was the first white woman to settle in the township of Pelican Rapids. The first bricks were made in a factory operated by Milo F. Jacobs, and they were hand-made brick, some of which may be seen to this day in several places in the village. W. G. Tuttle, the real founder of the village, built the first saw-mill and, when he failed, the mill passed into the hands of George Robinson. R. L. Frazee later became proprietor of this saw-mill, and about the same time opened the first flour-mill in the growing village. A Frenchman by the name of Eduard Oriel was the first barber and presumably operated the first news stand. Oriel is now living in Shevlin, Minnesota, having retired some years ago from the tonsorial business with a sufficient competency for his declining years. The first wielder of the rod and ferrule was Mrs. George W. Coye, who taught in a room in her own house. The first newspaper was established by a man by the name of Rathbun, whose wife succeeded him as editor upon his death. This paper was rightly called The Pioneer. The first band made its appearance in the latter part of the seventies under the leadership of Mat Nelson, its first leader. The suit worn by the drum major of this band was a gorgeous piece of sar torial raiment, a flaming red, trimmed in gold braid and lace, a masterpiece of the tailor's art, which would have delighted the heart of Beau Brummel himself. This suit, with the old gaily caparisoned baton, is now in the posses sion of Louis Amundson, who, by the way, is the oldest member of the pres ent city band. The first train steamed into the village in the fall of 1882, turned around, steamed out again, and for thirty-three years the villagers have been wondering when it would stop turning around. As has been said, Blyberg was the first postmaster. He retained the office from the time he was appointed in 1871, at the munificent salary of twelve dollars a year, until 1886, when Theodore Frazee succeeded him. Frazee was followed in 1891 by George Washburn, who died before his term expired, his wife being appointed by his bondsmen to fill his unexpired term. Charles Frazee, the present incumbent, was appointed October 5, 1895, and assumed the office on the first of the following month. The office now pays a salary of fourteen hundred dollars a year. The first mail received in the village in 1871 was brought by the carrier who rode the star route from Fergus Falls to Detroit, making the round trip once a week. Later in the seventies, mail was received twice a week, and with the tri-weekly train service established in 1882, mail was received and sent out every other day. At the present time the local office receives two mails daily, one by train from the south and the other by way of a star route from Rothsay. The former reaches the village in the evening and the latter about nine o'clock in the morning. The first rural routes out of Pelican Rapids were established in 1903, one running into Norwegian Grove township and causing the abandonment of Center Grove postoffice, and the other going north into Scambler township and bringing about the discontinuance of Bangor postoffice. In 1906 four other rural routes were established and at the same time five postoffices in adjoining townships were discontinued, namely: Stod (Trondhjem), Norwegian Grove (Norwegian Grove), Pel ican Lake (Scambler), Lida (Lida) and Bessie (Lida). As a matter of fact the star route carrier is really in effect a rural carrier, the law obligating him to deliver mail to any person living on the route he travels between Rothsay and Pelican Rapids. The star route carrier travels thirty-two miles daily and receives nine hundred and eighty-five dollars annually. The six rural carriers travel an average of twenty-eight and one-half miles daily and receive twelve hundred dollars annually. They serve a total of six hundred heads of families and cover the northwest part of the county and also reach into Becker and Clay counties. Carl J. Lundberg, on route No.2, is the only one of the mail carriers who has served since the establishment of the first rural route. The present postoffice building is owned by the postmaster and rented by him to the government. The present volunteer fire department was organized in the early spring of 1906, the authorization for its establishment being granted by the Legis lature on March 22 of that year. Four separate companies were created: two hose, one hook, ladder and chemical and one, engine company. Hose company No. 1 is now composed of O. B. Krogsatd (foreman), R. B. Strachen (assistant foreman), C. A. Hanson, B. L. Mathiason and Oscar Knutson. Hose company No.2 is composed of S. H. Lowell (foreman), R. H. Gripentrog (assistant foreman), B. M. Bjornstad and Allen Mills. The hook, ladder and chemical company has six members: O. E. Olson (foreman), .E. N. Haugen (assistant foreman), E. M. Stephenson, Louis Quamme, Anton Skalstad and F. J. Damschen. The engine company has five members: Henry Olson (chief), Louis Amundson (assistant chief), M. B. Myhre, O. E. Mathiason and J. L. Ranger. The equipment of the department consists of one hand-drawn engine, two hose carts, hooks and ladders, and about two thousand feet of hose. The department is housed in the village hall near the Pelican river. A tank containing twelve hundred barrels supplies ample water for all ordinary fires, and in case that supply is used, the river is utilized. The village has been very fortunate in the way of destructive fires, the last one of any conse quence occurring about six years ago when a planing-mill was burned. The firemen have an annual salary of six dollars, which salary is depend ent upon regular attendance on monthly drills. Absence from drill subjects the absentee to a fine of twenty-five cents. Most of the members of the fire department are connected with the Firemen's Relief Association, which pays its members certain reliefs for disabilities incurred while in the discharge of their duties as firemen. This fund was established by statute and consists of one per cent of all insurance premiums on property within the incorpora tion. This amounts to a little more than one hundred dollars in Pelican Rapids, the total amount in the fund of the department now being one thou sand two hundred and seventy-nine dollars. In the ten years that the fund has been growing not a single member of the department has been disabled and hence no money has yet been paid out. Louis Amudson is the secre tary of the fund. Members of the department are allowed one dollar for each fire they attend and if they are in attendance for more than one hour they receive fifty cents for each additional hour they are on duty. The president of the council and three members receive twelve dollars a year; the recorder is paid a yearly salary of three hundred and sixty dol lars; the treasurer, one hundred dollars; the fire chief fifty dollars and the assessor two dollars per day for time actually put in while assessing. It will be noticed that the village has no marshal and it has not had one for several years. The village building has two steel cells, but there have been no occu pants of the cells for many years. The duties of the marshal are performed by the township constable, O. N. Anderson. All of these officials except the assessor have a one-year tenure. The village owns its own electric light and power plant. The first plant was established in 1900 in a building which stands by the village hall. The dynamo was operated by steam and is still in running order. However, in 1906 the village built a second plant with water power for generating pur poses, utilizing the waters of the Pelican river. Thus the village has two completely equipped plants, so that when there is not sufficient water to run the one, the other can be used. In fact, so rapid has been the extension of the service that the 1906 plant is hardly sufficient to meet the demand and it is necessary to operate both plants at times. The first superintendent of the electric plant was C. M. Gray, who was in charge from 1900 to 1910. He was followed by Albert Hannes (1910-1912); since 1912 H. E. Stevens has been in charge. The "white way" was established in 1913 and with the installation of a double row of handsome cluster lights along Main street, the village assumes a real metropolitan aspect. The rate to consumers is twelve cents per kilowatt for the first one hundred kilowatts used and nine cents for all power used above that figure. Five customers use more than one hundred kilowatts. Electricity for power costs six cents per kilowatt on motors above one-horse power or on several motors aggregating that amount. It is inter esting to note that more than one hundred electric irons are now in use in the village. Pelican Rapids is justly proud of its band, an organization which dates back about forty years. About the middle of the seventies Mat Nelson organized the first band, which, with various re organizations, has been in continuous existence since that time. At the time the band was reorganized in 1894 it had the following members: Charles Gustafson, O. M. Isberg, Christ Gordon, Louis Amundson, Theodore Knudson, Edwin E. Pinkham, William Knudson, Carl D. Haugen, W. N. Harris, H. A. Renner, George Ahearn, R: S. Eberly, Louis Henderson and Ole Rakvog. Of these mem bers Louis Amundson is the only one still playing with the present band, and he still uses a brass trombone which was purchased for the first band in the seventies. The present band is composed of the following members: Cornets, O. B. Krogstad, Edward Lund, George Strom and Ralph Svare; trom bones, David Halbacken and Martin Arneson; alto, Elmer Thompson, Nor man Thompson and Marcus Hanson; barytone, Martin Myhre; French horn, Mr. John; basses, Louis Amundson and Otto Thompson; saxaphone, B. M. Borustad and Ferdinand Nelson; clarinets, Arthur Hanson; snare drum, Lawrence Amundson; bass drum, Ole Thorstenson. The band employs a skilled instructor, J. E. Racicot, who instructs the band once a week. The band is well-uniformed and is in constant demand for concerts for all kinds of occasions. It gives weekly concerts in the summer season in its band stand on Main street. The merchants guarantee the band forty dollars a month during the open playing season. Two or three concerts are given every winter in the village, which, with outside concerts, furnishes the band with a sufficient income to purchase instruments as they are needed, buy uniforms and music and employ an instructor. Pelican Rapids is in need of just one thing in order to give it new life-an extension of the Great Northern through to connect with the North ern Pacific. When this will come, no one knows, but the citizens have not given up hope that it will eventually be built. As a trading center it draws from a territory extending fifteen to twenty miles each way from the village and the general appearance of the town bears out the statement that it is destined to grow in size and importance. A summary of the business and professional life of the village shows that it is well supplied with industries of all kinds. The main features of its business and professional life are as follow: Auctioneer, O. N. Anderson; automobile dealers, Charles Frazee, James Logan, Charles Olson; automobile garage, Herman Grunewald; bakery, Edward Rude; barbers; George Frederickson, W. B. Snyder; banks, First National, First State, J. P. Wallace State; blacksmiths, G. H. Langlie, Legrude & Anger; clothing, Mr. Grina; clothing and shoes, Boston Clothing House; confectionery, A. Holmes & Company; creamery, Farmers Co-op erative, P. Klostad, president; dentists, J. F. Knutson, G. A. Anderson; dray lines, Edward Stephanson, Robert Strachen; drug stores, O. M. Axness, Andrew Peterson, O. J. Lee; elevators, Heiberg Elevator Co., Independent Elevator Co. (O. I. Sethre, manager), Farmers Co-operative Elevator Co., H. E. Frazee; flouring mill, H. E. Frazee; Furniture and undertaking, H. T. Haugen, Andrew Peterson; general stores, C. N. Haugen, J. M. Mills, Carr & Poss, Peter Peterson; groceries,. Louis Amundson, E. E. Mathiason, Ole Johnson, Mike Anderson; groceries and clothing, Henry Olson; hardware, Ole Meland, L. A. Williams, G. H. Goecke, John Mattson; harness, B. F. Gunsalus; hotel, New Richmond, B. J. Aaby, proprietor; implement dealers, C. D. Haugen, Edward Thurnau; jewelers, Olaf Sanstad; lawyers, H. N. Bruce; liveries, Toso Brothers, Thomas Ostrus; lumber, Pelican Rapids Lumber Co., Stenerson Brothers; millinery, Anna Knutson, Grace Stevens; meat shops, Knutson & Angle, G. C. Backstrom; moving pictures, Logan & Sanstad; musical instruments, Olaf Sanstad; notion store, N. Quandahl; photographer, E. R. Leaf; physicians, Theodore Satersmoen, Snyder, Boysen; plumber, W. N. Harris; pool, Bock & Hanson; restaurants, M. B. Myhre, Oscar Olson, Jesse Miller, C. A. Hanson; real estate, P. C. Frazee; shoes, A. Sanners; veterinary, E. L. Miller, Oscar Arickson. The present village officers are as follow: President, J. M. Johnson; trustees, P. C. Frazee, C. D. Haugen and C. W. Sherin; clerk, H. N. Bruce; treasurer, N. Quandahl; assessor, J. M. Ranger; justice, O. J. Morrison; constables, O. N. Anderson and L. H. Hannaford. The following letter was written by Sofus Ongstad, and apparently in an attempt to correct some misinformation that appeared in the Pelican Press. Your letter and two copies of the PELICAN PRESS have been received, one copy dated Jan 21, 1932, the other copy dated Jan. 28. I have studied the article of Mr. O. M. Cowles very carefully and it is a great article. Its chief merit is in not telling what has actually happened, but telling what has not happened. It is no wonder the Historical Society of Otter Tail County is kept guessing in ascertaining what is the truth when it has to rely on such historic information as presented by Mr. Cowles. Instead of clearing up old history he befogs old history. Mr. Cowles is a long ranges pioneer Pelican historian and he mentions another long range historian who hails from Tacoma, Washington, in the person of Henry Burdick, who had seen Mr. Harrison Harris at the town site at Pelican Rapids in 1869. Now I humbly claim to be one of the sixty-niners of the Pelican Valley and one who lives in North Dakota. Accordingly, I am eligible to membership in the long range historical society of both Norwegian Grove and Pelican Rapids, so I will take a whack at writing some more confusing things which some might say, it has never happened. He also wants dates. Well, the old pioneers who traveled in a covered wagon did not keep a diary or have an art calendar hanging on the inside wall of a covered wagon. They might have has DR. JAYNES ALMANAC advertising pain killer, or expectorant and other nostrums, but the almanac was generally stuck away in a box-hard to get at in a crowded wagon box. Mr. Cowles can certainly show dates. He takes June first and crosses Otter Tail River at Fergus just before dark and camps on the north side. To the old pioneers who knew the woods, underbrush, sloughs and swamps between the two rivers, it is such a marvelous performance that it can only be explained by the fact that in those days there were �giant in the earth� traveling in the Pelican Valley. I will mention another fact. The historians of Norwegian Grove never intended to write the history either of Pelican Rapids or of Pelican township, that is the business of the Pelican people themselves. The article in KVARTALSKRIFT was a short sketch of ten families and eight bachelors who had squatted on land in Norwegian Grove and Pelican Townships and who spent the winter of 1869 and 1870 in Norwegian Grove Township and their activities during that winter. 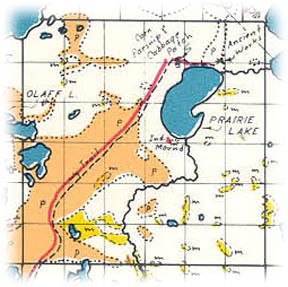 It was three families, Jacob Torkelson, Nels Hagestuen and Henry Ongstad (Henrick) and four energetic bachelors, John M. Johnson, Iver Dahl, Ole Raade and Henry Israelson who had crossed the Red River on a ferry and traveled up to Pelican Valley and did not stop before they reached Prairie Lake. This was before the Cowles family had squatted on any land. Who the first visitors were who called on them at the lake is reported in the PELICAN PRESS. On the second day of their stay at the lake Mr. Ed Andrews visited them. The men were absent from the camp exploring the country and to locate claims. Mr. Andrews was accompanied by an Indian woman whom he presented as his wife. She stayed a little distance behind and he called her to come nearer, she obeyed, but walked very slowly and showed visible signs of uneasiness in the presence of the party. She carried a baby papoose in the folds of a blanket on her back. Both the head and arms were visible above the folds of the blanket. Believe me, it was a sight for both my mother and Mrs. Hagestuen who had just left Norway ten and a half months before. J. M. Johnson, Iver Dahl and Henry Israelson picked their claims farther west in the township. Then came the visit of genuine Chippewa Indians painted and decorated. The women became scared and the three families left in a hurry. Mrs. Hagestuen did forget her onion plants. Then they all squatted on land in Norwegian Grove. Mr. Johnson, Mr. Israelson, and Mr. Dahl retained their clams, broke land on all three claims during the summer, but Mr. Dahl and Mr. Israelson sold out later and left. I suppose some will claim this is not happened but Theodore Jacobson and Mrs. H. T. Hagen, youngest daughter of Jacob Torkelson, are still alive and can be interviewed any time. WE CAME TO PRAIRIE LAKE MAY 24 OR 25TH, 1869. I will mention in this place that Jacob Torkelson lent his breaking plow later in the season to Mr. Cowles who broke some land west of Prairie Lake. Theodore Jacobson will remember that. The next great event that excited the settlers in Norwegian Grove was when the call came from Mr. Harrison Harris to build him a house on �the site of the wonderful mill power� which Mr. Harris claimed he had discovered, a call which the sturdy Vikings most cordially accepted. They sharpened their axes and set a day when every man was going. All the men started at early dawn with oxen, axes, chains and home-made sleighs, in which there was no sign of a nail. All were to meet at the school section north of the rapids. Most came south of St Olaf Lake. The Tolleruds came on the ice of the lake and good luck was with them. Their two dogs caught a big ferocious timber wolf that happened to cross the lake. Woe unto any being whether human or wild that dared to cross the track of the great Viking host. Having arrived at the forest they grabbed their shining axe in their sinewy hands and the steel gleamed in the air as it was buried deep in the proud oaks which soon bowed their crowns to the ground. The logs were soon loaded on the sleighs and hauled to the mill site and the house was built in a day. The Harris house was the beginnings of Pelican Rapids. As far as I can guess, this great event happened about the latter part of February 1870. This story about building and finishing the Harris house in the winter may seem to some readers to be doubtful, but the weather was exceptionally fine, hardly any snow before New Years, just enough snow to make good sleighing. The heaviest snowfall was in the latter part of March which Theodore Jacobson will remember because he and others went clear down to Ten Mile Lake to buy seed wheat and they had quite a time to get home. A week of so later there appeared smoke for several days in the direction of the mill site. It was clearly visible from my fathers homestead N. E. quarter of section 25, 136, 44. One day Lars Nelson, our neighbor went to see what was the cause of the smoke. He found that Harris and some other men had been there and built a big fire to thaw the frozen ground to get dirt for covering the roof and plastering the house. In the house was Tom Birge and a stock of groceries. Mr. Nelson was the first man to open trade relations in Pelican Rapids. The next day my brother Oluf and the writer went over carrying some muskrats which was the common currency in those days. We found a log house with a leaning roof, one door and two windows, one on either side of the door. We bought some coffee, sugar and New Orleans molasses and then went home where my mother feasted on coffee. She was very fond of the beverage which she had been without nearly all winter. My brother Hans ordered an axe from Mr. Harris, but the axe was slow in coming. One day after the snow had thawed away but before the grass had started to grow I went to Pelican Rapids to buy some groceries. Mrs. Harris had arrived. The store had been divided in two by a white curtain. She sold me the small bill of groceries and I asked for the axe. The axe was there and she handed it to me and I started to go home without paying for it. She asked for money and I had quite a time explaining to her that my brother Hans had worked on the house, but he would pay for it. This incident impressed my memory because my English vocabulary was very limited at that time and I made the explanation with great difficulty. But it proves the fact that Mrs. Harris lived in the first house built in Pelican Rapids in the spring of 1870. I agree with Mr. Cowles that immigration came thick and fast, but that was in the summer of 1870. Pelican Township was settled that year both east and west and the history of both the town and the township had been written both truthfully and well as far as the events I know of are concerned. Mrs. Will Cole Harris has done great work and the people of Pelican Rapids owe her a medal. In the language of Billy Rogers at the disarmament congress �I am strong for Doc� so I am strong for Mrs. Cole Harris, but very much stronger for the house of Harris, the first house built in Pelican Rapids in 1870 and which was used both as store and residence by Mr. And Mrs. Harris. I have started to wonder at who was really the boss of the builders, who staked out the ground and what was the size of the house. Ole J. Tollerud and Theodore Jacobson might possibly recollect it. Why not interview those two men? They were along to build it. It might be of interest to those who knew Iver Dahl and Henry Israelson that Mr. Dahl died in Walsh County, North Dakota, past 84 years old. He has one son who is a doctor at Devils Lake and another son, T.J. Dahl, is an attorney and served as state attorney for Walsh County for several terms. Henry Israelson took up land in the Hickson neighborhood in Cass County, North Dakota. He acquired a lot of land, but did not reach a very old age. Several of his sons live in Cass County. In conclusion permit me to say that we old long-range historians are subject to one weakness. We are getting old and our mental faculties begin to fail. We are apt to over-estimate our recollections and knowledge of pioneer history, so we constitute ourselves as severe censures of what others write. We need to be tolerant, and by all means say nothing unfavorable about the pioneers who are in their graves. The greater part of them were able and upright men, hardy, frugal and hard-working. Let us all strive to write their history truthfully and speak kind words over their graves. This article compiled from a family history book written and published by Esther Bergerud Ugstad. Retyped by Bruce Dancy Bruce Dancy (bdancy@shaw.ca) Nov. 2002. Places of birth for Pelican Township in the 1905 state census.